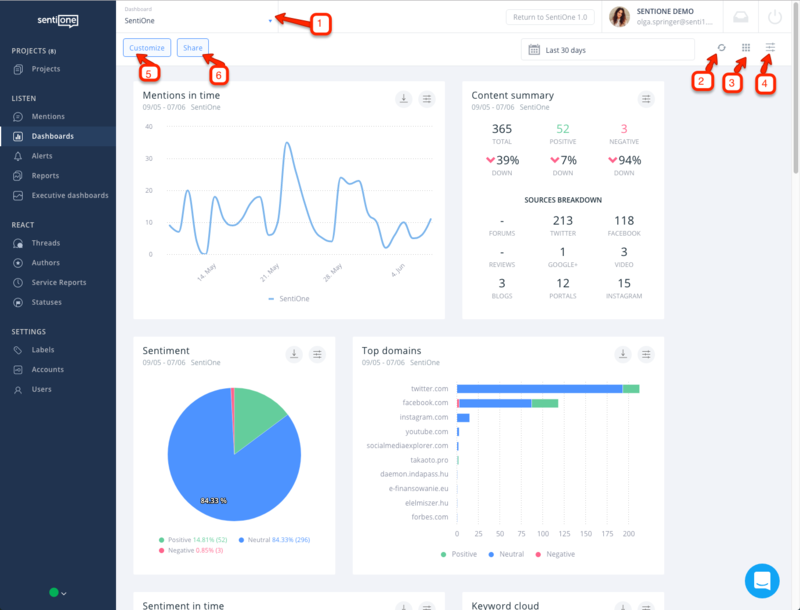 Dashboard is where you can find the analysis of your online listening projects. They are showcased as customisable widgets presenting collected data. 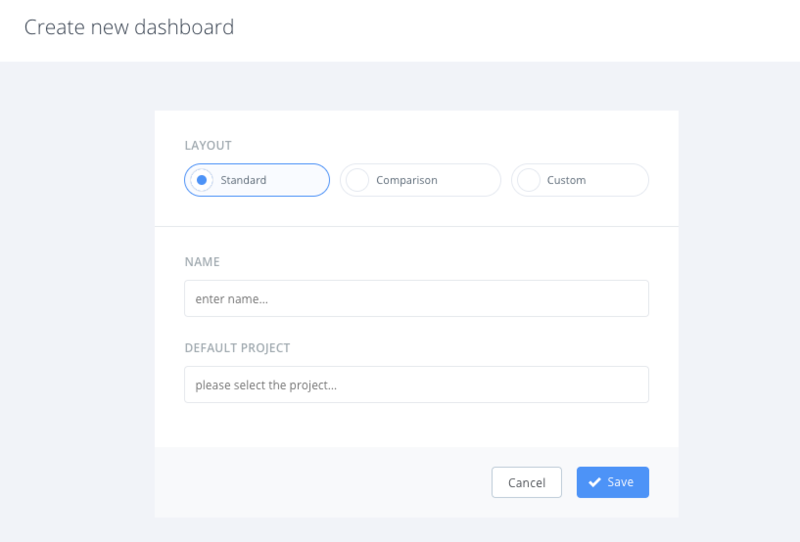 Dashboards are created automatically for each of your projects while forming a new project (unless you switch it off during the setup process). You can choose the widgets to display and arrange them freely. There are two ways of creating a new dashboard. Either as a part of project setup process or manually in Analysis module. If you haven’t got any dashboards yet, you can create a new one from the Analyses’ list level in Analysis module. In this case, click the '+CREATE' button. Decide on Analysis layout. Please note, that you can change and edit the widgets afterwards. There are three kinds of Analysis available: Standard, Comparison, Custom. Name your Analysis– enter the name in the field. Choose project – at this point, you should pick one of your projects for the analysis. To do so, enter the name of your projects in the 'Default project' field or choose from the drop-down list. Any predefined Analysis can be easily customized with widgets of your choice. You can also use “Custom” Analysis type and add your own widgets from scratch. To add widgets click “CUSTOMIZE” button in the upper left corner of the dashboard view. Analysis list – where you can see the list of available dashboards or look for a particular dashboard by typing its name. Adjusting the layout of widgets to screen resolution. Data filters displayed on widgets according to projects, dates, domain groups, sentiment, author’s gender, mention types, granulation, tags, statement’s language. Particular filters are presented in the Mentions module. Adjust – clicking on this icon displays a dashboard editing panel where you can freely add or delete widgets displayed on the dashboard. Share – you can share your online listening analysis with everyone, using a public link (works even when someone is not logged in to SentiOne). In SentiOne we have 8 categories of widgets you can add to your Analysis dashboard. Their availability depends on the chosen plan. Any widget you add to your dashboard can be customized in terms of showcased data. To do so, click 'Edit settings' icon on the top right corner. After you do that, a form will appear with the filters section you already know from the Mentions module. Can I share my dashboard with people who don’t have the access to SentiOne tool? Yes, you can. Go to Online dashboards functionality description to learn more.